A tool for selective colour, colour pop, saturation and hue shift photo adjustments. Tintii's unique ability is to automatically detect the major colours in a photo, making adjustments quick, easy and more precise than other means. Available as a plugin to Adobe Photoshop, Photoshop Elements and Corel Paint Shop Pro, or as a separate program.Tintii is available as a plugin for Adobe Photoshop, Photoshop Elements and Corel Paint Shop Pro. Tintii Photo Filter is Photoshop plugin for selective colour and other effects. ...... for greyscale effects. Full online documentation is provided to help you get the most from the program. 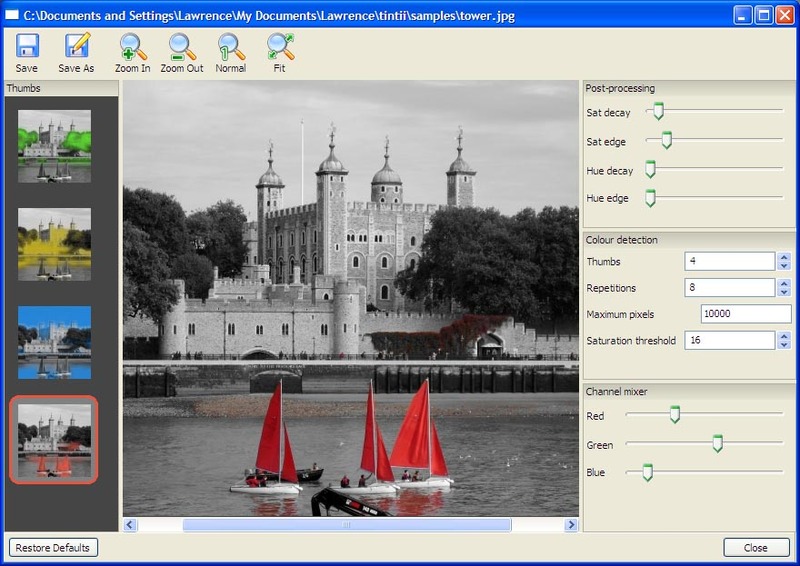 Tintii Photo Filter for Linux is available as a plugin for Adobe Photoshop, Photoshop Elements and Corel Paint Shop Pro, and as a separate standalone program. A major update of tintii has been released with a raft of new features to take the filter beyond simple selective colour effects. The core of tintii remains the same, with its unique ability to automatically select the dominant colours of a photo. The program now supports hue, saturation and lightness adjustments on individual colours, as well as a new "Hardness" postprocessing slider that is particularly useful when working with subtle gradients. In addition to these new features, the interface has been given a fresh look to better position controls. A full online help system has been included for the first time also, documenting all controls and providing some advice on how best to achieve the right effect. Send photos to family and friends by email. Qweas is providing links to Tintii Photo Filter for Linux 2.4.0 as a courtesy, and makes no representations regarding Tintii Photo Filter for Linux or any other applications or any information related thereto. Any questions, complaints or claims regarding this application Tintii Photo Filter for Linux 2.4.0 must be directed to the appropriate software vendor. You may click the publisher link of Tintii Photo Filter for Linux on the top of this page to get more details about the vendor.